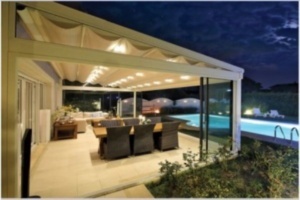 Our four seasons retractable roof system with its various series is, fundamentally, a rail roof system with retractable, 100% waterproof awnings that enable our clients to make the most of their outdoor areas and use them all year around. 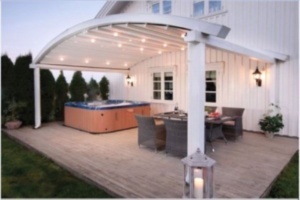 The retractable patio roof system with its clean lines and modern design, provides protection from sun, rain and wind whilst being an aesthetic addition to your outdoor area. Designed for large areas, our retractable outdoor roof systems are manufactured using only the highest quality materials, requiring minimal maintenance. These systems offer a great alternative to building an extension. However, they’re still classified as a ‘temporary structure‘ with no thermal ratings or foundations required as an extension so it’ll save you buckets of money too! Customization of retractable roof systems for commercial uses can be a great tool to make use of, that will help expand brand awareness for your company. It’s an absolutely fantastic way to advertise. Putting logos, designs and text on your retractable patio roof will draw attention and let passers-by know who you are, what you do, and most importantly, it will draw them in to find out more. 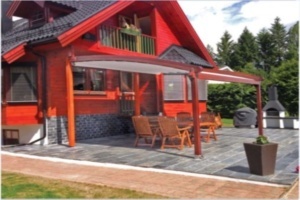 Should you wish to find out more about our Retractable Patio Roof Systems and our other Retractable Roof Solutions, or if you are after a free consultation where we would gather your requirements and advise you of the most suitable product, then please call us on 07546 343499 or 07546 343411. Alternatively, you could fill out our contact form or send us an e-mail at info@awningsandcanopies.co.uk.